"Do these pants have full side zippers?" "No, they do not have the full side zipper. These pants are an entry level pant. 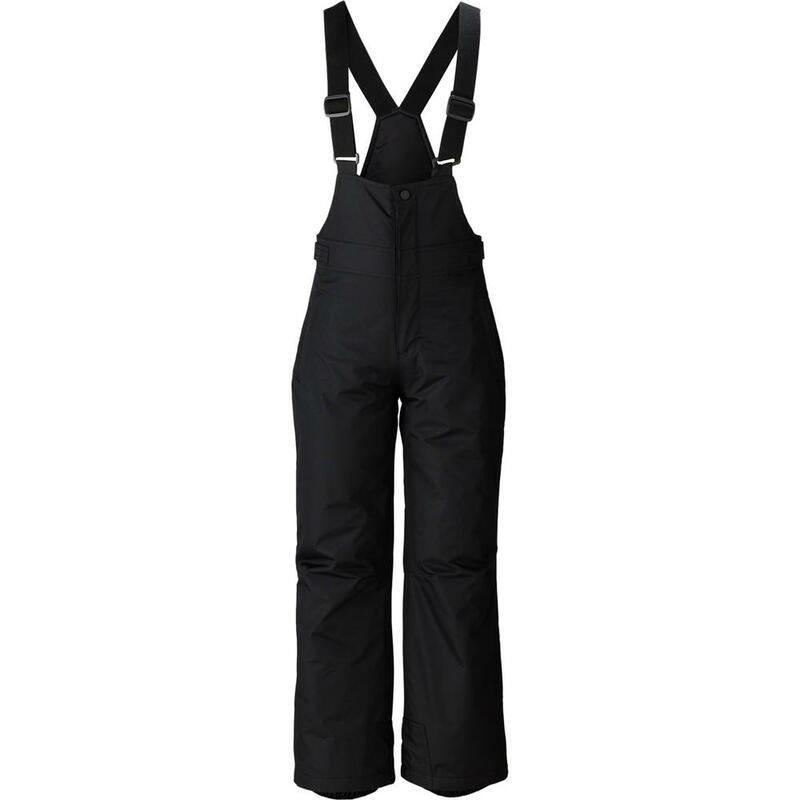 I would recommend the The North Face Makalu Insulated Ski Pant or the Descente Best Shell Ski Pant. Both are not so entry level ski pants and have the full side zippers on them. " "how warm would these be? Looking for warm pants for snowmobiling in wisconsin!" "These would be perfect for you! They are warm and the bib will keep you protected from the elements." "My husband's pant size is; 36 waist 38 length, would any of these overalls fit him? Thank you~"
"The pants are not going to have an inseam of 38", it will be more like 34". For a size 36 you should probably try the size L or XL." "What pant size is L? I wear mens 36.. will L fit me?" "A 36 waist will fit into a large just fine!" "Do these come in a size 34w x 30 inseam and would that be considered a Medium?" "Yes, a 34" waist would most likely be a medium. 34 waist is one of those in-between sizes that can usually try medium or large. " "What is the inseam for the medium size?" "MY WAIST IS 49" AND INSEAM 28" WHAT SIZE IS RIGHT FOR ME"
"If your waist is 49" you will need a 4XL. The inseam is 33.5" on that size though so you will need to get it tailored. " "on the men s pinnacle bib. what is the inseam for the small S size. myinseam is 29 and the large i ordered is way to big." "Size small will have a 30" inseam and a 28-30" waist." "I wonder if you could please tell me where these have pockets and if those pockets are zippered or velcro/snap. Thanks." "There are three zippered pockets: one pocket on each hip, as well as one pocket on the right back side of the pant. " "Can I wear those pants to go skiing?" "Yes, these are ski pants! " "I'm 6,5" 300 lbs size 42 in waist what size will be good for me ? " "You would be an XL based on your measurements. " "Will these bibs go over snowboarding boots?" "I would like to buy these ski bibs for my son. He wears a 32/34 jean. What size should I purchase to get the significant amount of length? Thank you"
"We would recommend based on waist measurements to go with a size M. You can view the size chart here ." "I am looking for bib that will roll up small when not in use. I want to add cold weather gear for my harley. Also I am 6' 3" with 34 in inseam. XL for me? Thanks Dave"
"These would work really well for you in terms of being very compact-able. An XL would fit someone with a waist of 40-42". If that is your size then that is what we would recommend!" "hi, what size should i buy, i am usually a S. thanks. " "You would need to take your measurements and compare them to the sizing chart here! This item runs true to size so you would probably be a size small if that is your normal size." "DOES THE WAIST HAVE ANY STRETCH? I'M A 36/30 PANTS SIZE"
"The waist measurement for a size Large in this pant measures 36-38". This will give you a little room for fit that you are looking for!" "I am a slim man.. The item description says that it is "relaxed fit". Would it be too loose for me?" "The Pinnacle bib is adjustable, so if you are getting your proper size you should be able to adjust the waist tighter for a perfect fit." "I weigh about 250lbs with a 40" waist with a bit of a gut larger than my waist and have a 29" inseam. I am 5'8" tall What size would fit me best?" "We would recommend going with the 2XL. The length may be a little longer than your regular inseam, but with boots on it will take a little of that length up for you." "I wear a 34 - 36 waist and a 34 inseam. what size should I get"
"According to your measurements, you are between a Medium and Large. We recommend size large because of the adjustable waistband tabs, adjustable suspenders and to accommodate for your baselayers. The inseam on both is 32". Click HERE to view Boulder Gear's size chart for accurate measurements. Hope this information helps!" "Is the pinnacle the same as the Velocity Bib?" "Thank you for your inquiry. We do not carry the Velocity Bib to compare to Boulder Gear Pinnacle Insulated Ski Bib. If you need further assistance please contact us at 800-818-0946. " My husband and I wore these in Keystone Colorado for Christmas vacation. We snow boarded, snow mobiles, tubes down hills, and rolled around in snow. These kept us warm and dry. Just wore a mid-weight base layer and sweat pants underneath. Never got cold. My only very minor complaint was that the overall straps (Even though adjustable kept slipping and they would fall off my shoulders). An easy fix. I was worried because they seem so thin but was so happy I found these. Great price and quality. Indeed waterproof (wet snow proof) and somewhat breathable. Very good for those wet sloppy snow days on the chair lift. No surprise wet behind. Breath-ability is so-so but I sweat heavy anyway when skiing. The alternative is to spend hundreds on high end bibs/pants. The choice is your's. Good budget buy. This Boulder Gear Ski Bib did what it needed to do. It kept me warm and dry all day on the ski slopes. The only negative (if there is one, was the velcro waist strap). There is no reason to spend more of your hard earned money on a more expensive ski bib. You will be happy with this one!! After several attempts to find a pair of women's snow/ski bibs that would fit my 5'8'' plus-size (18) frame, I found these to be just ticket! I wasn't concerned about being fashionable while learning ski, I just wanted something that would 1) be roomy enough to move in and 2) keep me warm and dry on the slopes. These bibs did both beautifully and at a very affordable price. Being so lightweight, I was concerned they wouldn't keep me warm but, as it turned out, my fears were unjust - I was toasty warm even all day and even while skiing at night. You won't be disappointed!